Horikiri Iris Garden (堀切菖蒲園, horikirishobuen) is a Japanese style Iris garden located Katsuhika ward, Tokyo Metro. There are 200 kinds 6,000 Iris flowers in this garden. In middle of June, Iris bloom their beautiful flowers. 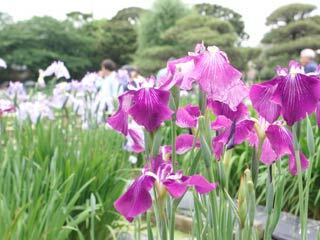 Horikiri Iris Garden is also one of the oldest garden in Tokyo. Iris were brought from Asaka Pond of Oshu Koriyama during Muromachi era. Because this area was used to be huge marshy area, Iris plantation was very popular since old time. Record said the first Iris planted here was brought from Asaka pond of Oshu Koriama in Muromachi era. During the Edo period, Iris became very popular. In 1801 to 1803, Matsudaira Sakingo bought this garden and created many kinds of Iris.